Trade secrets are common in virtually every industry and range from complex technical designs to simple business processes. Prior to the enactment of the Defend Trade Secrets Act (“DTSA”), if an employee illegally took a valuable design or process to a competitor, the company could only seek recovery under state law. However, on May 11, 2016, The DTSA created a federal private right of action and expanded the benefits for victims of misappropriated trade secrets. The DTSA automatically creates a federal private right of action if a company’s misappropriated trade secret is “related to a product or service used in, or intended for use in, interstate or foreign commerce.” The remedies available under the DTSA include injunctive relief, damages, and attorney’s fees. The DTSA also includes a three-year statute of limitations. While the DTSA creates a new federal pathway to protect trade secrets, it does not preempt existing state law. Consequently, companies now have more jurisdictional options when pursuing trade-secret litigation. The DTSA also creates a mechanism to recover stolen trade secrets in “extraordinary circumstances.” According to the DTSA, a court may “issue an order providing for the seizure of property necessary to prevent the propagation or dissemination of the trade secret that is the subject of the action.” The court may issue a seizure order only if specific requirements are met, including: (1) another order or form of equitable relief is inadequate; (2) immediate and irreparable injury exists; (3) the harm to the applicant outweighs the harm of the person against whom seizure would be ordered or a third party; (4) there is a likelihood of success in showing that the information is a trade secret and the person misappropriated the trade secret; (5) the person has actual possession of the trade secret/property; (6) the application describes with particularity the location and item to be seized; (7) the trade secret would be destroyed “if the applicant were to proceed on notice to such person”; and (8) “the applicant has not publicized the requested seizure.” A seizure order must also meet strict statutory requirements. While the DTSA’s stringent requirements make it difficult to pursue a court-ordered seizure of a trade secret, companies now have the ability to recover trade secrets in extraordinary circumstances. The DTSA offers many financial advantages to companies, including access to exemplary damages (awards of up to twice the amount of damages) and attorney’s fees for the willful and malicious misappropriation of trade secrets. Attorney’s fees are also available if a motion to terminate an injunction is made in bad faith. However, these provisions are not automatic. In order to qualify for exemplary damages and attorney’s fees, the DTSA’s compliance provision requires companies to give notice of the whistleblower protection available under the DTSA. The broad language of the DTSA means that most agreements and policies require attention. Any Non-Disclosure Agreement, Employee Handbook, Employee Contract, or other agreement “govern[ing] the use of a trade secret or other confidential information” created or executed after May 11, 2016, should be reviewed and updated. Thus, if an employee operating under a contract signed after May 11, 2016, quits and takes valuable trade secrets to a competitor, the employer cannot recover exemplary damages and fees, unless the contract was updated with the appropriate notice requirement. By proactively updating agreements now, companies can save millions in future trade-secret litigation. Failure to act may prohibit litigants from seeking exemplary damages and attorney’s fees in misappropriation suits under the DTSA. Provided the relevant agreements comply with the statutory requirements, the DTSA is a win for virtually all companies and industries. 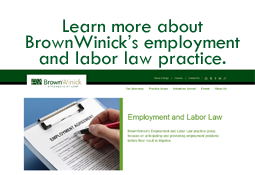 Should you have questions about the DTSA and its impact on your business, please contact me or your BrownWinick attorney. 18 U.S.C. § 1839 (3). Under Iowa law, the Uniform Trade Secrets Act protects the misappropriation of trade secrets. Iowa Code § 550 (2015).